I was born and raised into one of the smaller sects of Mormonism. My family ties go back to the very founding of Mormonism. I became a member of the Mormon faith at the age of eight, and never questioned the things taught to me while growing up. I called myself a Christian, and said that I believed, but I had no understanding of genuine Christianity. The bible speaks of two gates in Matthew chapter 7 the narrow and the wide. The wide gate points this way to heaven but it leads to destruction in hell. Only the narrow gate (Jesus Christ) leads to eternal life. Jesus Christ warned that not everyone who calls him Lord will enter the kingdom of heaven. This was me; I was a false convert for 30 years of my life. I was only paying lip service to God while mocking him by the life I was living. The sect of Mormonism that I was raised in went through many power struggles, splits, and divisions. One question I could never wrap my mind around was this; “With so much split and division, how can this be the one and only true church?” As I pondered this question I started to pray to the Lord that I wanted to know the truth. About nine years ago, around the age of 30, the Lord answered my prayer. He opened my eyes and gave me a new heart with a desire to search him out. I then desperately needed to know the answer to the question; “What must I do to be saved?” I began to study and for the first time was able to really understand the gospel. God is holy, righteous, and just and must punish sin. The bible says, “That the wages of sin is death.” God was not first in my life. I was an idolater because I had created a God in my mind that did not care about sin. I became undone, the Holy Spirit had convicted me of the sin in my life and I knew that I deserved the justice and wrath of God. As I continued to study I realized that I never understood that Jesus Christ is God himself in the flesh. My eyes were opened to understand the death of Jesus Christ on the cross. The only way God can forgive sin is through Jesus Christ. His perfect sinless sacrifice paid the penalty for sinners, when the wrath of God was poured out on him in our place. As I continued to study the Gospel, God revealed to me that my life was lacking repentance. 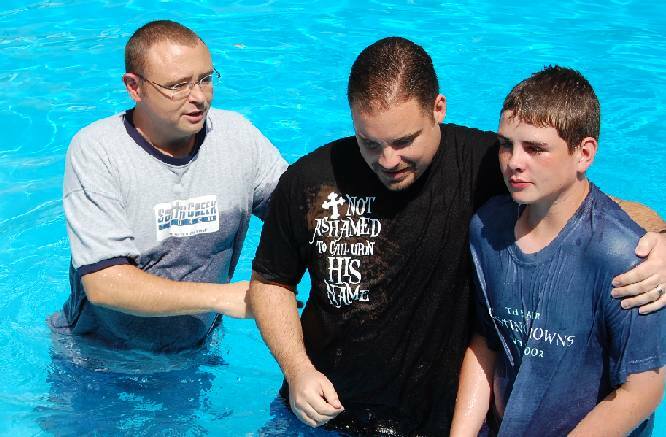 I had never been willing to turn away from my sin and surrender to Christ as Lord. Since that time, my life has been completely changed through God’s saving Grace. The sinful things I once loved to do, now have no power over my life. I now love and desire the things of God. Coming out of Mormonism was a process that did not happen over night. I was finally able to fully let it go after coming out in stages. Christ has transformed my marriage and family. After saving me he also saved my son Derek. 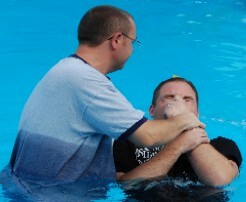 We were baptized together on September 23rd, 2007 as a public testimony of his saving Grace.